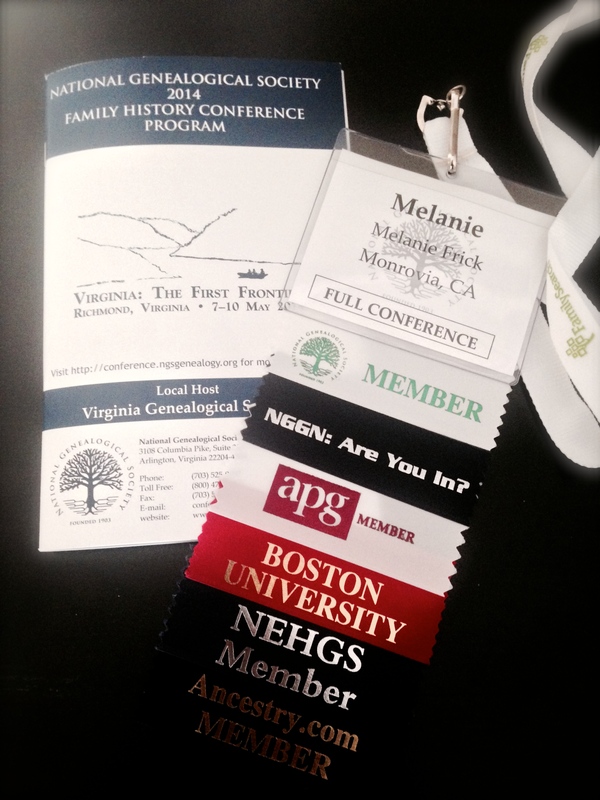 My lack of recent updates can be explained by the fact that the 2014 NGS Family History Conference was held last week in Richmond, Virginia. This was my second time attending a conference sponsored by the National Genealogical Society, and it was just as much fun as the first! I stayed at the historic Linden Row Inn in downtown Richmond, within walking distance of the conference center, the Library of Virginia, and the Richmond Public Library, and I made it to more than a dozen lectures, spent some quality time in the exhibit hall, attended a celebration of fifty years of genealogical credentialing, and met with old friends and new. I even Tweeted a bit! Some highlights included lectures by Elizabeth Shown Mills, who always provides inspiration for creative ways to look at records in order to break through perceived “brick walls,” and Tom Jones, who had everyone in the audience laughing at his anecdote about tracking down county court records in a small Midwestern town. I also attended several helpful sessions on specific research topics, including tax records, slave claims, and German genealogy. Warren Bittner did the impossible by making the Meyers Gazetteer seem (almost) easy to decipher, which instigated a mad dash to the exhibit hall to purchase the guidebook that he recommended. The exhibit hall is also where I was able to peruse a sample application portfolio to the Board for Certification of Genealogists, following a helpful lecture about the intensive, but worthwhile, application process. I made sure to catch a lecture by Maureen Taylor, “The Photo Detective.” Anyone who follows my blog will know how much I love analyzing antique photographs, so it was interesting to hear her speak about “Photo Identification 101” and to see some of the more outlandish fashions of the mid-nineteenth century. Maureen authored the book The Last Muster: Images of the Revolutionary War Generation, and she and contributor David Allen Lambert were kind enough to autograph my copy. 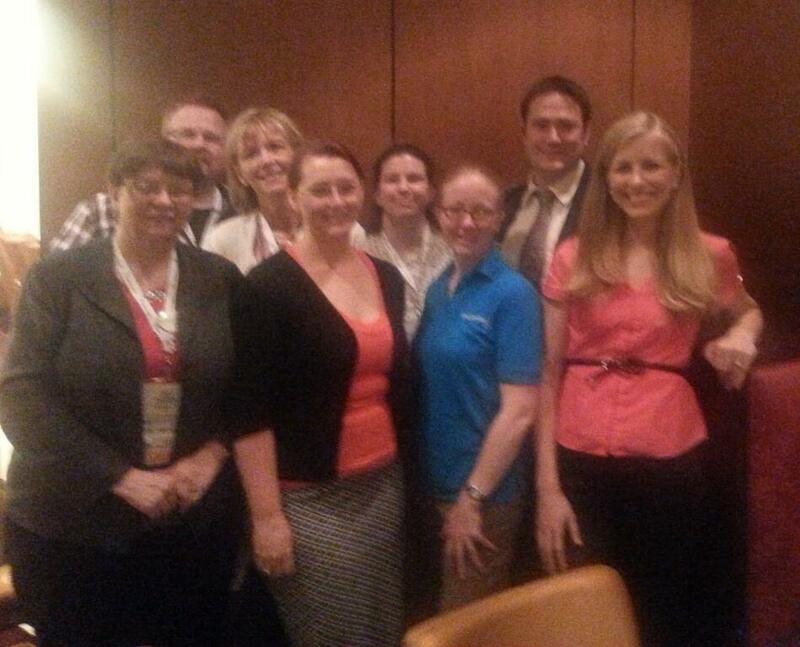 Good times were also had with the other conference attendees, whether making new friends at mealtimes and in the lecture halls, catching up with a former grad school classmate, or meeting with several of my fellow board members and supporters of the NextGen Genealogy Network. All in all, it was a jam-packed week of genealogy fun, learning, and connecting – well worth the jet lag! This entry was posted in Professional Development, Travel and tagged #ngs2014gen, conference, National Genealogical Society, NextGen Genealogy Network, professional development on May 14, 2014 by Melanie Frick.